Do you need carpet stretching? If you need it you’ll know. You will have unsightly bubbles that make it difficult to move furniture and is embarrassing to show visitors. But more importantly it can be a tripping hazard. If there’s ripples, waves or buckling in your carpet then your carpet needs to be professionally stretched. If so you probably have a few questions – how much does carpet stretching cost? Why do I need carpet stretching? Maybe you want to know the process of how to stretch your carpet? 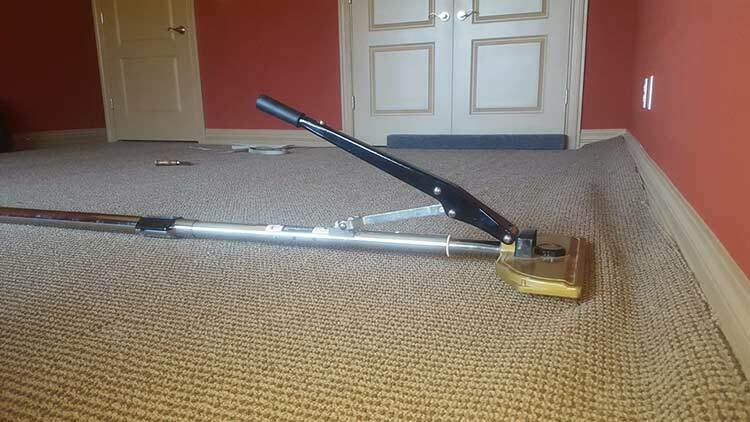 We use a power stretcher to professionally stretch your carpet and guarantee fabulous results. Our Carpet Stretching Cost is Far Less Than Replacement. Carpet stretching costs approximately 60-80% less than the cost of replacing the carpet. It can also be done in the same week as booking instead of the long process of picking out carpet and having it stretched during installation. Our carpet stretching gives you the feeling of having new carpet without the cost. Carpet stretching not the problem? Try tile to carpet or seam repair. Click here. Why Choose Carpet Stretching Over Replacement? Even if you take the time to pick out new carpet it needs stretched to be installed. So you aren’t saving any time by buying new – you’re doubling it. Did you know that the average life span of carpet is 20 years? If you have only had your carpet a decade, why not dye it and have it stretched instead of replacing it? Interested in Learning How To Stretch Carpet? Carpet stretching is a vary labor intensive process if you do not have the right tools. We start by removing the old tacks keeping the old carpet in place. We then use a power stretcher the meticulously stretch the carpet towards the wall. Once everything is lined up we retack the carpet into it’s original place. We use a state of the art power stretcher that allows us to stretch the carpet evenly in only a few hours. This gives you the tightest longest lasting stretch at a price that you can afford. If you live in Minneapolis or Saint Paul, Yep! We Fix Carpet is the best carpet stretching near me. In addition to the services most carpet stretching companies perform, like seam repair, carpet cleaning, and odor control, we also perform carpet dyeing which can fix any color damage or loss that you may have. To us carpet stretching is not a service; it is a way of preserving carpet for years to come. Replacing your carpet should only be the last resort. We’re the best carpet stretching specialist in Minneapolis; give us a call if you want to know how to get rid of carpet bubbles. We also provide quality carpet stretching to Burnsville, Richfield, Savage, Shakopee, Prior Lake, Apple Valley, Bloomington, Roseville, New Brighton, Golden Valley, Plymouth and all the major suburbs and cities around Mpls and St Paul, Mn. Our carpet stretching gives you the feeling of having new carpet without the cost. Need seam repair or carpet to tile repair? Click here! Carpet stretching is a vary labor intensive process if you do not have the right tools. We start by removing the old tacks keeping the old carpet in place. We then use a power stretcher the meticulously stretch the carpet towards the wall. Once everything is lined up we retack the carpet into it's original place. If you live in Minneapolis or Saint Paul, Yep! We Fix Carpets is the best carpet stretching near me. In addition to the services most carpet stretching companies perform, like seam repair, carpet cleaning, and odor control, we also perform carpet dyeing which can fix any color damage or loss that you may have. To us carpet stretching is not a service; it is a way of preserving carpet for years to come. Replacing your carpet should only be the last resort. We are the best carpet stretching specialist in Minneapolis; give us a call if you want to know how to get rid of carpet bubbles. We also provide quality carpet stretching to Burnsville, Richfield, Savage, Shakopee, Prior Lake, Apple Valley, Bloomington, Roseville, New Brighton, Golden Valley, Plymouth and all the major suburbs and cities around Mpls and St Paul.